There are a lot of reasons why people get a tattoo. There are those who simply want to look cool. Others have it as a part of their culture. For most people though, it is for self-expression. Whatever the reason is, getting a tattoo doesn’t just show the bravery of the person going through the process, but the artistry of the person doing the tattoo. In various parts of the world, there are specialized ways of placing colorful inks in people’s skin. Although these days, tattoo procedures are more carefully done, the more traditional (and more painful) techniques are still practiced. Let us take a closer look at these techniques and appreciate the process behind the creation of a tattoo masterpiece. This technique was said to have originated in Japan and is one of the most difficult techniques to master. The process is not only fascinating to see, but the final results are totally stunning. It starts with a handle made from bamboo wood which was smoothed down and rounded for accuracy and comfort. There are up to 2 dozens sharpened points that serve as the tattooing needles. To achieve a stunning effect, the bamboo handle is punted to the skin after the ink was applied to the sharp points. With the quick and hard punting, the needles are pushed deep into the skin to let it set on a location. This is the most painful part of the entire process. Once it is done though, it would be an amazing work of art. 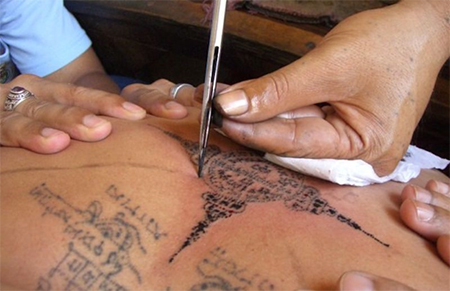 Considered as one of the oldest tattooing methods dating up to hundreds of years ago, this technique is barely used these days. It was popularized in small countries like Papua New Guinea and Samoa. To ensure the success of this technique, the person’s skin has to be stretched out first. In fact, an assistant might be necessary to stretch the skin. A sharpened rake will then be attached to a long horizontal handle plus a solid stick on the end. This will serve as the basic tool in punting the rake into the stretched skin. Back then, the rake used was made of bone (although until now some tattoo artists preserve this tradition). Once it is ready, it will be dipped in ink before tattooing begins. Considering the fact that this is a very old technique, you can only imagine the pain. This is a very common technique in Southeast Asia, especially in ancient Thailand. There are still a lot of Thai people using this technique now due to its religious connections. In fact, modern Western tattooing techniques were said to have originated from this method. The metal with hollowed-out tubes is used to contain a smaller and thinner metal rod. It is then placed inside the tube. The bottom part of the rod has an extremely sharp point. The tattoo artist starts by dipping the point to the ink before gradually placing the tube over the skin and firmly pushing down on the tube over and over again just like a sewing machine. This is done to pierce the skin and evenly distribute the ink in the area. All three techniques are extremely painful, but the results are just amazing. They look like no other. There are also a few tattoo artists left to still have a deep connection with these techniques until now. The process might be more painful but the final output is like no other.